EmpathyLab: Read stories, build empathy, make a better. New scientific research shows that identifying with book characters develops our real-life empathy. 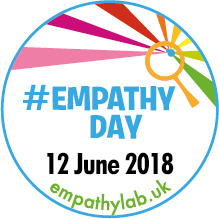 In the run up to Empathy Day on 12 June, join EmpthyLab for story-based activities for families with a special focus on helping children understand other people’s feelings and perspectives better. Author Chitra Soundar will share her books, and involve children in storytelling – her latest book, You’re Safe with Me, is featured in the 2018 Read for Empathy Guide for parents (see http://www.empathylab.uk). Although this event is free, please click on the ‘buy’ button to reserve your place.